I finally scanned a few Advertisements from different Publications that I have collected and thought it might be interesting to share. I do have a few more that will be added soon. Ruler of the House - in my dreams at least. Oh, wonderful! 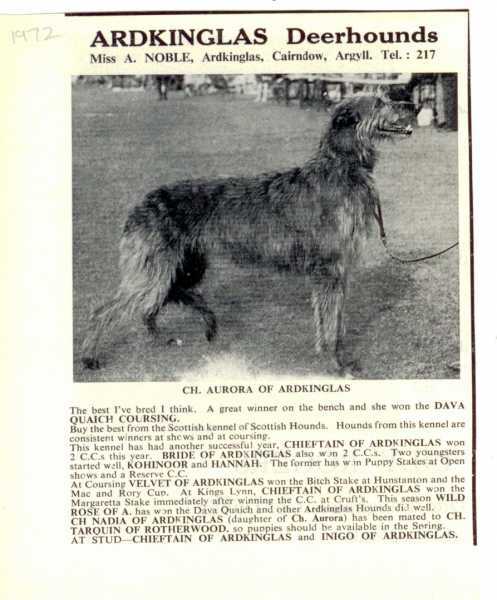 I remember quite a few of these hounds and it's lovely to see them again. Thank you so much. Sorry you had problems and thank you for persevering - I love the 3 digit telephone numbers (what was that all about?? 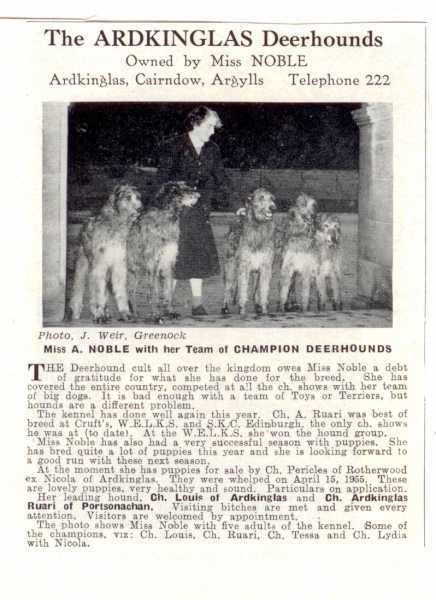 - @HairyBeasty Elise remembers, but not me, 'cause I'm from Yorkshire and we were lucky to have a larynx never mind a telephone)..
Really good to see how the deerhounds of today differ slightly from a few years ago. Thanks for sharing this. Very great publications - Thanks for the post here. 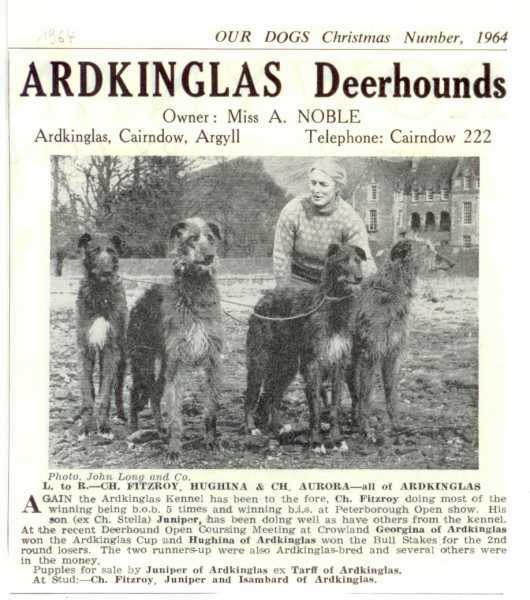 Wnderful pictures of bygone hounds from the Advetisments. 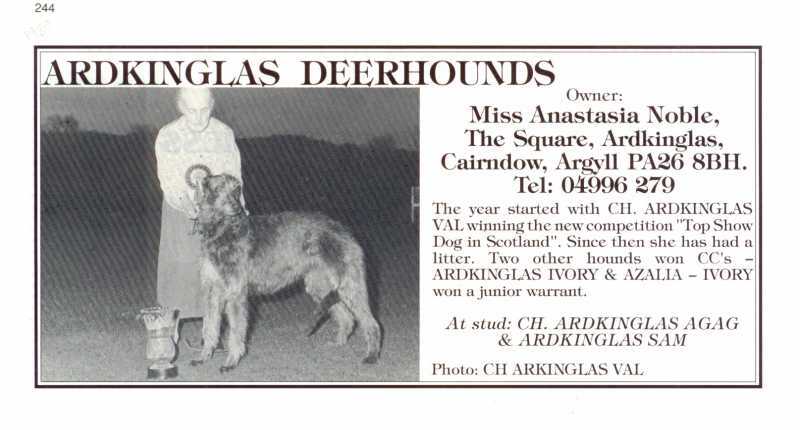 Nice to see what some of the great names(hounds and owners) looked like. Here are a few more - enjoy. These are fascinating. The poses are great aren't they? Much nicer than today's rather predictable show stacks. Thanks for posting them Thomas. Eve is still very much missed - she was a star. 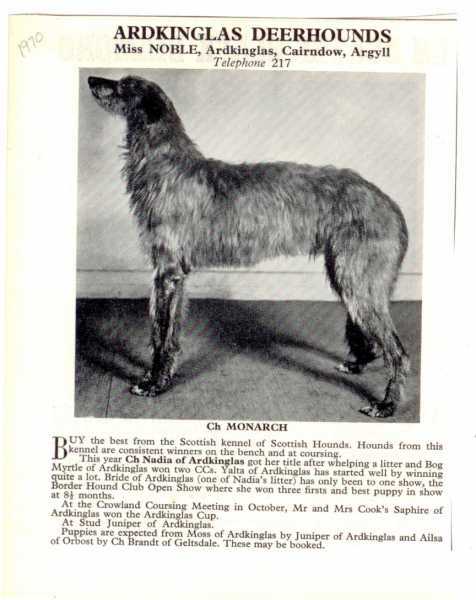 You have a very great collection from the old publications. Thanks for the scan and upload here. Beste GrÃ¼ÃŸe aus dem verregneten Deutschland. 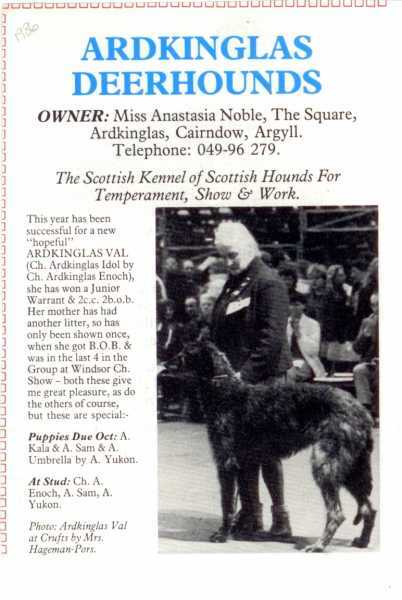 Thanks Thomas for the idea with the collecting from kennel advertisements. I have begin collect this also. 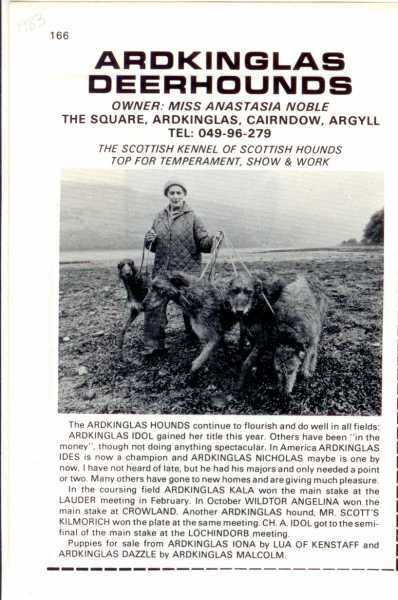 Here my special collection over The Ardkinglas Deerhounds from Miss Anastasia Noble. 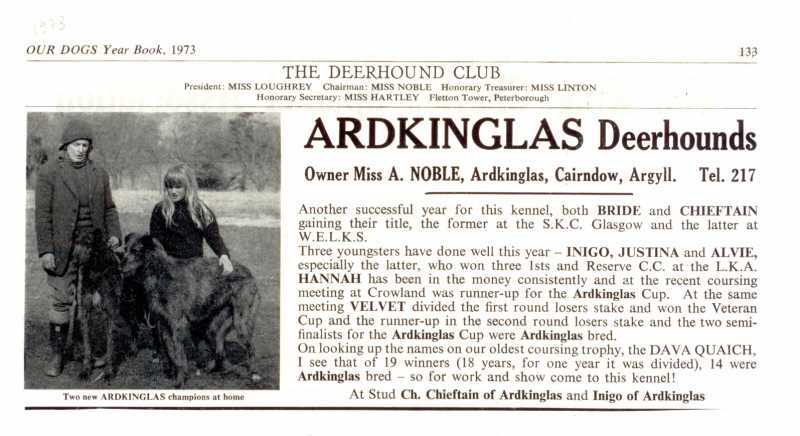 The great grandfather from my Yoki is Ardkinglas Quintet. I have scan the advertisements. Last Edit: 8 years 3 months ago by Joerg Yoki. 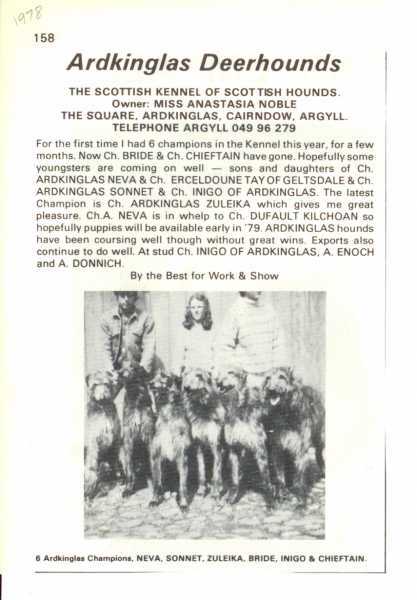 Thanks for sharing those JÃ¶rg - always great to see some of the old champions - I got a few more that go back to 1912 - have to find time to get those scanned and will post them. There are a few of the Ardkinglas that stand out - love Monarch - wish I could have seen him up close. Tasgall wrote: Thanks for sharing those JÃ¶rg - always great to see some of the old champions - I got a few more that go back to 1912 - have to find time to get those scanned and will post them. 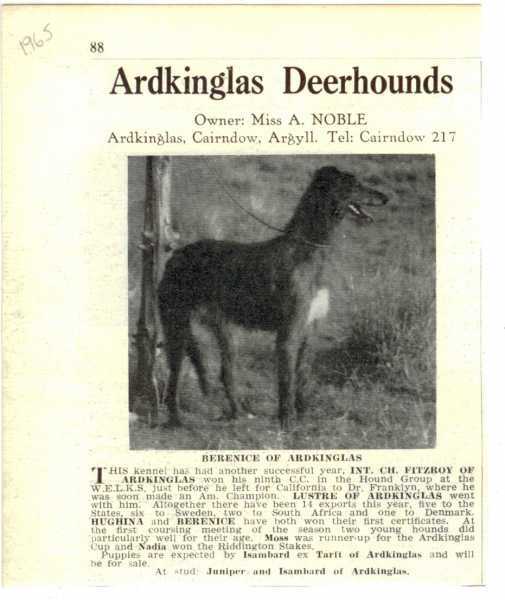 There are a few of the Ardkinglas that stand out - love Monarch - wish I could have seen him up close. Thanks Thomas for your friendly message. Yes, I find Ch. Monarch of Ardkinglas very nice also. IÂ´m very interest more to see from your collection. I have few pieces more also, but nor not scanned.